LRAD’s range of public address and mass notification systems products is now available in the United Kingdom through Vitavox. Increasing demands on law enforcement agencies have stretched resources to the limit and the tools they use must be portable, rugged, easy to use, cost effective, and fill multiple needs. LRAD fills the critical gap between the poor voice quality and limited broadcast range inherent in bullhorns and vehicle P.A. systems, and kinetic measures including water cannons, tear gas projectiles, rubber bullets, pepper balls, Tasers, and flash bang grenades. 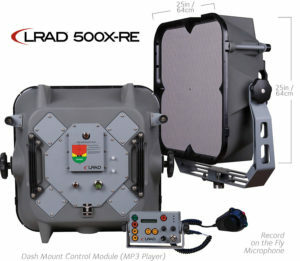 LRAD is not a weapon; LRAD is a highly intelligible, long range communication system and a safer alternative to kinetic force. 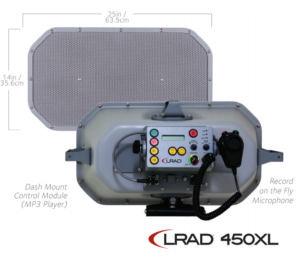 LRAD systems safely broadcast highly intelligible messages, warnings, notifications, instructions and commands from close range out to 2000 meters to individuals or large crowds in a wide variety of law enforcement situations. LRAD’s optimized driver and waveguide technology ensures every broadcast cuts through wind, engine and background noise and is clearly heard and understood, even inside vehicles and buildings. Through the use of live or recorded multilingual voice messages and alert tones, LRAD systems establish large safety zones, unequivo­cally determine intent, resolve uncertain situations, and save lives on both sides of the Long Range Acoustic Device.